Ok, before we even start this post, I have to ask. Does anyone else see a baboon in the picture of the lemon meringue above? Or perhaps Simba from the Lion King? It is kind of like a sighting of the Virgin Mary, but without any religious implications or unexpected media attention. But perhaps this is a forewarning of one, truly wild dessert…so with that in mind, off we go. For the Mom’s birthday dinner menu, I was given three simple, low sodium requests: (1) risotto cupcakes, (2) juicy lamb, and her ultimate, favorite dessert, (3) lemon meringue pie. As I’ve confessed before, I am no baker. And while risotto cupcakes and a rack of lamb were well within my comfort zone, the idea of making a perfectly, crumbly crust sent my nerves into overdrive. Lucky for me, though, my mother doesn’t fall too far from the proverbial tree (yes, I’ve raised her and not the other way around) and much like her daughter, she finds that dough often gets in the way of the good stuff, like heaping mounds of lemon custard and crispy meringue. So for her birthday treat, I set out to make mini, lemon meringues, sans crust. And since I think everything looks more elegant when it is cooked in individual dishes, I used small ramekins to serve each pie-less pie. 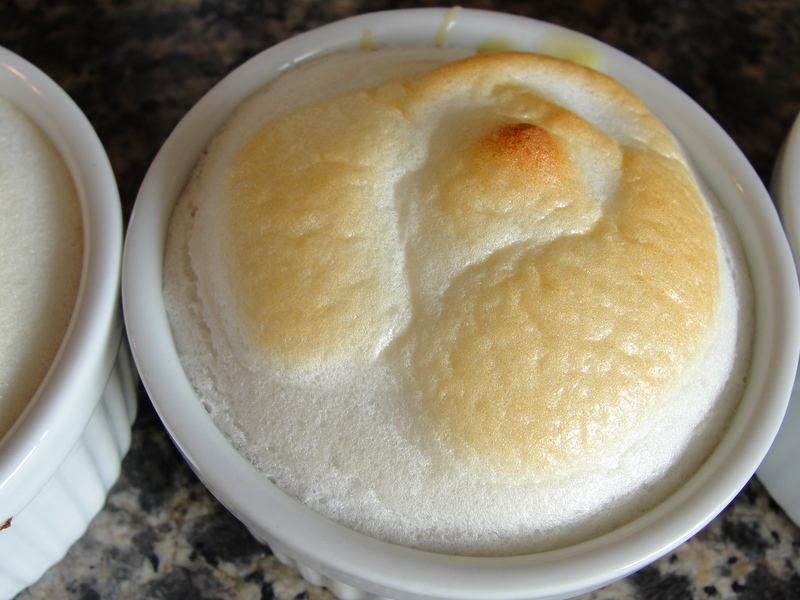 The recipe is incredibly simple – one pot for the custard, a mixer for the egg whites, and an oven to perfect the dish – but I will confess that I had some trouble with the meringue. Not realizing that I did in fact own a whisk attachment for my stand-up mixer, I over-whipped my whites, by hand. After 30 minutes of aggressive and erratic stirring, I was left with a milky mixture that did not form peaks by any stretch of the imagination. While I was encouraged to begin again, I stubbornly decided to go ahead as planned and plop what was left of the intended meringue on top of the custard. Again, I’m not a baker. Although I knew the meringue would never resemble the silhouette of an Alpine mountain range, I did hope that it would harden and brown, which is really the most important component of the dish anyways. And thanks to my obstinate personality, the slop on top did just that. 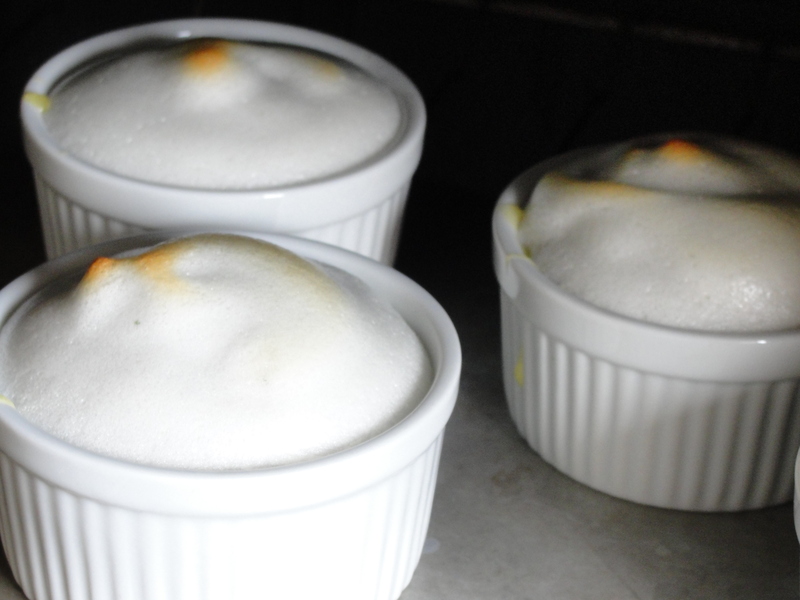 The little meringue hats were not picture perfect, but they tasted just right. So grab some cream of tartar and your hand-held mixer (or at least some brawny dude with a culinary degree) and make some lemon meringue pots to ring in spring or a well-deserved birthday celebration. Chow on. 1. Place egg whites and cream of tartar in the bowl of a stand mixer fitted with the whisk attachment. 2. Beat egg whites until soft peaks form and then gradually add sugar and continue beating until stiff peaks form, approximately 1 to 2 minutes. 1. Adjust the oven rack to the middle position. Preheat oven to 375 degrees F.
3. In a medium saucepan, combine cornstarch, water, and sugar. Whisk to combine. Turn heat on medium and, stirring frequently, bring mixture to a boil. Boil for 1 minute. Remove from heat and gradually, 1 whisk-full at a time, add hot mixture to egg yolks and stir until you have added at least half of the mixture. 4. Return egg mixture to saucepan, turn heat down to low and cook, stirring constantly, for 1 more minute. Remove from heat and gently stir in butter, lemon juice, and zest until well combined. 5. Pour mixture into remekin and top with meringue while filling is still hot. 6. Make sure meringue completely covers filling and that it goes right up to the edge of the crust. 7. Bake for 10 to 12 minutes or until meringue is golden. What the WHAT? Where was I when these were served?? Lemon meringue happens to be Gold’s favorite dessert (and in my top 5), just in case you were wondering. Can you please make this for me?! I love lemons!! You don’t say what to do, or how to incorporate the butter in your recipe for lemon meringue cups.